“Daytona”, “Talladega” and “Watkins Glen,” those names run through the dreams of NASCAR fans as racing season opens. They know there’s not only great racing to be enjoyed at NASCAR tracks, but non-stop tailgating fun, as well. Those fans lucky enough to travel by RV have a leg-up on the competition. Here’s a primer on how to plan a full season of NASCAR RV tailgating. For a winning season of NASCAR RV tailgating experiences, start by choosing your NASCAR itinerary for the season. Besides local and regional racing, NASCAR features three national racing series – Sprint Cup, Nationwide and Camping World Truck Series. They also have a sanctioned racing season in Canada and Mexico. You might also have a favorite driver or two that will help you decide which races to follow. Drivers like Kurt Busch, Tony Stewart and Jeff Gordon have built loyal throngs of fans who line the stands every time they race. If you’ve been following NASCAR racing for years, you probably already know which drivers you’d like to watch and their scheduled races. Newcomers to NASCAR racing can look here for schedule information, and then decide how many races you’ll travel to attend. An important tip: order tickets early! Many NASCAR tracks, even those holding nearly two hundred thousand fans, have been known to sell out during the more famous races. Every NASCAR track has unique attractions, and they’ve created RV camping and tailgating traditions at each. Daytona International Speedway, for example, offers NASCAR fans five different RV campgrounds within sight of the speedway. During races like the Daytona 500, thousands of NASCAR-loving RV campers bring out their best tailgating recipes and enjoy a non-stop party over race weekend. Bristol Motor Speedway in the hills of Tennessee, Sonoma Raceway near Sonoma in California’s Wine Country and Alabama’s Talladega Superspeedway with its convenient infield RV camping are just three of the tracks that are known for great RV tailgating possibilities. To get the latest in RV camping and tailgating information, and to learn tips such as what can be carried into the grandstands, go to each individual track’s website and follow the links to their fan guide. Also, find out which RV campgrounds require reservations and be sure to make yours early for this race season. Now, let’s talk about food! That is, after all, what’s at the heart of every great tailgate party. The convenience of an RV kitchen can make all the difference in whether your NASCAR tailgate party crosses the finish line first. Think about which of your favorite recipes could be easily eaten at the track—grilling brats and burgers, cooking a batch of your famous chili or roasting veggies in foil are all tailgating traditions. Food Network’s website offers dozens of tailgate party recipe ideas, everything from Uncle Bubba’s Wings to Deviled Crab Potato Skins. The Tailgating.com blog also features favorite recipes from hundreds of tailgate party aficionados. Remember, if you’re traveling to the track by RV, you won’t be limited to a hibachi outside your mini-van. You’ll have well-designed kitchen appliances perfect for preparing a meal on the road. There’s really no better way to host a tailgate party than in the shade of a great RV! You’ve chosen your RV roadtrip itinerary that includes time at your favorite NASCAR tracks. You’ve selected your very best tailgate party recipes, bought the groceries and planned for kitchen utensils and party ware. All that’s left to do is pack what you need and head for the track. 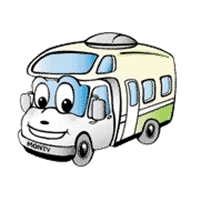 Be sure to check with El Monte RV Rentals if you will be renting an RV for the trip. For additional information also see NASCAR Vacation, NASCAR RV rentals, NASCAR RV Camping & Tailgating. It’s going to be a great NASCAR racing season! Don’t miss the excitement; start making your plans now for at least one weekend of race-car-watching-tailgate-partying fun this year. This entry was posted in NASCAR RV Vacation. Bookmark the permalink.